Khan Academy, best known for its free online library of video tutorials, is using the summer months to offer in-person teacher trainings in places like Chicago, New Orleans, and Redwood City, California. The workshops are integrating what teachers and Khan Academy staff have learned over the past few years while experimenting with different ways of integrating videos and Khan assessments into classrooms. “Now that we are a couple of years in it, we have enough evidence of really great teacher practices that we are trying to share with a broader audience,” said Khan Academy President Shantanu Sinha, at a training workshop in Redwood City earlier this week. Khan Academy isn’t new to many educators. Thousands of teachers are using the videos to reinforce concepts, introduce ideas, or as review resources. And as Khan Academy has grown in use, it has also expanded beyond videos by offering things like practice exercises and a dashboard for teachers to track how students are doing on those exercises. Teachers sign up their students as a class and can monitor if students are watching videos and if they’re doing the associated practice exercises. This back-end view of how well a student understands the material helps teachers determine who is ready to move on and who needs more help. “We think you should have the power to look at your data and say, ‘These four kids are ready to get off Khan Academy and do a deep dive into a hands-on project,’” workshop facilitator Maureen Suhendra said. She emphasized that Khan Academy believes learning should be mastery-based, kids don’t move on to a new skill until they’ve mastered the foundational ones. “We’re not about sitting kids down and leaving them in front of computers all day,” Suhendra said. In fact, she told the teachers gathered that kids get tired of the videos and exercises if they are used for more than an hour. “It’s not that Sal is a better teacher and, ‘Oh, let's bring him into the classroom,” said Anne Hong, an eighth-grade math teacher at the training. 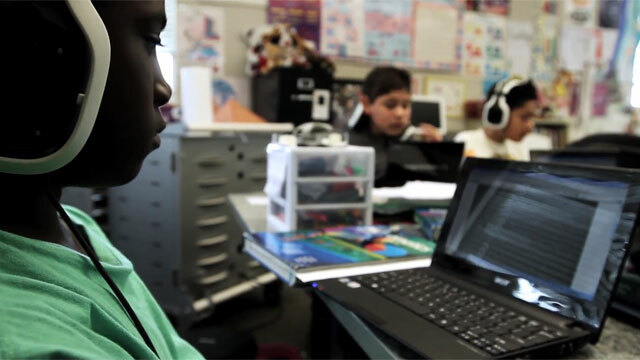 “But more that you are extending learning beyond the classroom.” She’s found that allowing students to access the lessons online has freed her up to do more engaging projects and one-on-one work in the classroom. Educators at the workshop also learned that the site shows how each video lines up with Common Core standards, broken down by grade level. While the core materials on the site are still centered on K-12 math instruction, Khan Academy is beginning to branch out into other subjects as well, building up its video library on subjects ranging from art history to computer science. Those areas aren’t as robust as the math content, but Sinha says the plan is to build in ways to demonstrate knowledge and learning that are appropriate to each subject. “Math is a subject area where it’s very clear how to assess the student,” Sinha said. “Computer science is a subject area that is fundamentally a creative art. It’s about creating programs that do things.” So assessment will be different, including more peer collaboration and review. The Bay Area training focused on three specific ways to implement the program. The simplest way to get started is to teach by unit, and use Khan Academy videos to help reinforce the material and for practice. One teacher asked what to do if a student finishes quickly and is bored. Suhendra suggested giving her a deep-dive project to apply the new skill or asking her to help mentor peers who didn’t catch on as quickly. “We want you to supplement Khan Academy with projects and materials that deepen student learning,” Suhendra said. Another way to approach that quick learner is to let her move ahead on Khan Academy to the next unit. To keep the class under control while giving students freedom to move at their own pace, some teachers allow kids to work on the preceding unit, the current unit, and the next unit. This method lets slower kids have some time to review and catch up, and faster kids can move ahead without getting bored. Teachers provide “playlists” for students so they know which videos and exercises should be completed for each unit. The third implementation strategy -- and least traditional -- is a completely student-driven approach where students have access to all the units in the curriculum and progress completely at their own pace. “This is definitely the most ambitious way to use Khan Academy,” Suhendra said. “It requires a lot of flexibility and support from administrators.” This allows students to free themselves from the teacher's daily pace and move on their own. “We find when students are given this much ownership over learning they seize it,” Suhendra said. Khan Academy will not be able to offer in-person trainings like this one to all its users, but the website still provides teachers with instructions on how to get started as well as those looking for new ideas. But for those who were able to attend, the workshop was valuable. “With this whole flipped model and the new standards coming out, it is nice to have some guidance,” said middle school teacher Larkin O’Leary. “I don’t think they are going to tell me how to do it, but maybe just give me some more strategies or different ways of thinking.” Other teachers said it was nice to meet the people behind what can feel like a faceless product. And teachers isolated in classrooms throughout the school year love to network and get ideas from one another. For Khan Academy staff, the events are a good way to take the temperature of users. For example, teachers at this training wanted an easier way to make a playlists on the site so students know what they need to accomplish for each unit. “We do find that there’s a lot of value in engaging with teachers directly and hearing their questions so we have a better understanding of their challenges,” Sinha said.